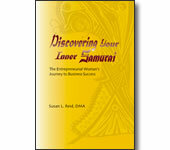 Our Inner Samurai is marvelously creative and deliciously fun. This 2 minute video of unusualist, Raymond Crowe doing a hand shadow show beautifully exemplifies our Inner Samurai's creative spirit. With over 20 years of experience, Raymond Crowe is one of Australia's most sought after entertainers. Watch him deliver an intricately woven tapestry of magical artistry, cheeky humor, and fun. This video was sent to me by my virtual assistant, Carolyn Freeman. Thanks Carolyn! So, what did you think? Were you touched? Amazed? Let us know!